Apple's 20-nanometer A8 processor in the new iPhone 6 and 6 Plus was fabricated by Taiwan Semiconductor Manufacturing Company (TSMC), according to Chipworks (via iFixit). 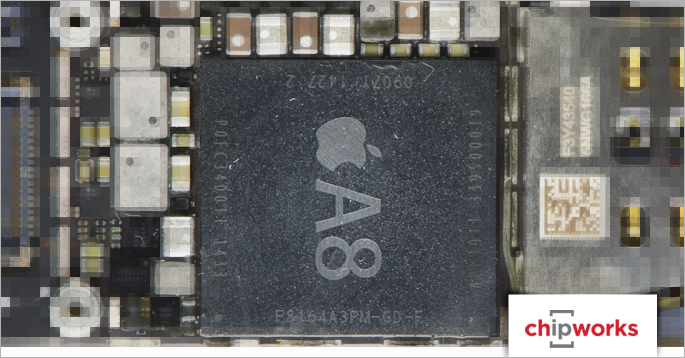 Chipworks has been analyzing the various parts in the iPhone 6 and the iPhone 6 plus following its release today. While the iPhone 5s used a 28-nanometer processor, the iPhone 6 and the 6 Plus have a 20-nanometer processor, as has been widely rumored. According to TSMC, its 20-nanometer process technology can result in speeds that are much higher than its 28-nanometer chips. The 20-nanometer process also results in a physically smaller chip that draws less power. Ahead of the launch of the iPhone 6 and 6 Plus, there were multiple back and forth rumors that made it unclear whether Samsung or TSMC was manufacturing the chips destined for the new iPhones. Previous generation chips, such as the A7 in the iPhone 5s, were manufactured by Samsung, but Apple reportedly entered into a partnership with TSMC in an effort to reduce its reliance on rival Samsung. The shift is also part of a larger effort by Apple to diversify its supply chain, which cuts down on potential manufacturing issues. Though TSMC created the 20-nanometer chips for the iPhone 6 and the 6 Plus, rumors have suggested that Apple hasn't ended its relationship with Samsung entirely. The company is rumored to be producing the 14-nanometer chips that will be used in future iOS devices next year, indicating that Apple has plans to continue having both TSMC and Samsung create chips for its devices. According to Apple, the A8 chip in the iPhone 6 and 6 Plus offers a 25 percent faster CPU and 50 percent better graphics performance compared to the A7 in the iPhone 5s. Steve wouldn't have let Apple use anything larger than 19 nanometers. Actually concerns me. Despite the hate on these forums, Samsung is really good at what they do. Hopefully no logic board failures down the road. TSMC is a completely validated semiconductor factory. They've produced chips for NVidia, AMD, Sony (PS4), Microsoft (XBox One), among many other companies. There is nothing to be "concerned" about. Especially when your phone comes with a warranty. I don't care about the technical details only that I have no lag and the phone runs smooth and does what I want. Geekbench scores of around 3k on these new phones are roughly the same as the first unibody MBP's in 2008. It's amazing how far we've come. Sorry but why would you have 6+ tabs open at the same time? Because it's a $1,000 phone and you should be able to have as many tabs open as you want. No matter, I wasn't interested in carrying an iPad mini in my pocket anyway. I'm sending back my 6 Plus, because apparently, they sent me a wrong product. Everyone keeps saying how it is so huge or even an iPad Mini replacement. Today, I had it in my chest pocket most of the time, hardly noticing that it was there. I can easily hold it in one hand, even use it with one hand for the most common activities (without even using reachability). When I wrap my hand around it, my thumb and middle finger are less than one inch apart (and I do not have giant hands). "Wrapping my hand around it" is not a sentence I have ever used when describing the iPad Mini. So, Apple, where is the real 6 Plus? Where is that unwieldy tablet phone that people keep talking about? That's what I ordered! Great news. Apple should move away from Samsung to keep the secret of new devices. There is no ‘Chinese Wall’ in Samsung. I have a feeling that Apple sent me the wrong product, because I didn't find that gigantically huge phone that everyone keeps talking about in my 6 Plus box. It's fast all right. Then launch Safari, open a few sites~maybe six windows. The RAM drops to 16MB free. Go to another app and iOS purges the cached pages. Go back to Safari and the pages have to re-load. This is obviously a problem when finding a page on LTE and then calling someone, switching back to the page and - NOPE!